Another card just because. This is my first time playing the Color Me creative challenge. I wanted to play with some of my new dies and a colour challenge was the perfect venue. I needed to do something creative after a very stressful day. The engine blew on my son's car on Sunday night when he drove back to Muskoka after dinner at our house. Talk about feeling helpless when he called at 10:30 at night that smoke was pouring out of the engine and he was almost 3 hours away. Thankfully I had just got him a CAA membership a few weeks back, so he got a tow. Today I had his car towed here and my husband found a dealership on the other side of the city that can look at it. So I called for another tow. Now we wait to see what the damage is. Okay back to my card. I die cut circled Scribbles in Coastal Cahanna, White and Basic Grey. Glued them to a white card base and decorated with some grey sequins and enamel dots. Fab Tracey, I love these dies and such a great design. The more I see these scribbles I want them!! ABSOLUTELY in LOVE with this Tracey! This is sooooooooo fun! LOVING all the circles!!!! LOVE this, Tracey! Thanks for another great idea on using these dies. Sorry to hear about the vehicle troubles. Ugh! oh i so want those dies.. what a pretty card.. This is such a fun card, Tracey! The colours are fab. Thanks for the prayers for Rosie... we need all the help we can get! Hope you get the car sorted out, painlessly! You keeping well too? Gorgeous card! Love it! And sorry to hear about your son's car!... Hopefully, the damage is minimal! Gorgeous card! Love this with the colours that you created with and the sequins and dots, so clean but what a statement! I have these dies and have been itching to use them...so inspired by you. thanks! Such a fun card! Love those die cut circles!! Hope the car repairs are reasonable. These scribble dies look amazing with all the sweet colors :) great design! Ooooh Tracey a momma's worst nightmare, I feel your pain! So glad he's okay and great thinking on the membership...whew! Fun card today, those dies are so versatile! Love the colors and those dies are perfect! Stunning simple card! Love thees colors and why oh why did I not buy those dies! Fantastic card. Great idea to use those scribbled dies, and I like how you combined enamel dots and sequins together. I am in LOVE with those scribble circles!!!! like an abstract painting..love it! Wow! This card is simply stunning! Great work! Btw... hope the damage to your son's card isn't too bad. Oh man! I've been resisting these dies and you are making me want them!!!! she did not come out with a die for that?! WOW, I LOVE the colors T- Fab design! Beautiful!! I love the color combination! Wow! So interesting and fun! Great design and color, too! 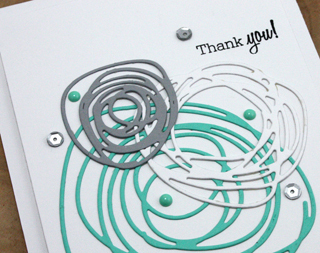 I am loving those scribbles every time I see them & your card is one of the best, Tracey! I still remember trying to get home for Christmas break & my car broke down in a little Calif town. Of course it was night & we were 3 poor college kids who planned to sleep in the car until we could get a mechanic in the morning. The tow guy called his wife & told her he was bringing 3 kids home to sleep on the floor of their house. Wonder if that would still happen today. Glad your son was OK.
Fabulous card, Tracey - love those dies! Thanks so much for playing along at Colour Me...! I love the bling on the scribbles!